After all that hard work, the grades are in and I can smile. And within 1 week after I finished my classes, I started up again. BOO! Luckily, my dietetic courses don't start for another week so I am only taking 1 course right now. The course is technical writing and I am LOVING the book! However, the online class is super time-consuming with 3-5 quizzes a week and 1-2 assignments per week. Lots to squeeze in for an 8-week course. On a seperate note, I ordered my books for this summer and they are here! Sadly, the price of the books is close to the price for an Ironman race and in a few weeks I will be paying for my dietetic classes, equivilant to a brand new bike. Oh, the price for education over fun. But, it is all worth it! I'm so glad that I made the decision to pursue a dietetic degree and get my RD credentials. When I finished graduate school, I knew nutrition and wellness was my passion. Even with a great graduate education in Exercise Physiology (specifically my Adv. Exercise Physiology, Cardio physiology and Respiratory Physiology courses) I want to have a career in nutrition. Although I want to specialize in sports nutrition, I see myself working with all types of people who seek improvements in performance and weight loss. Because exercise is mandatory for a long and healthy life, I see no other way to teach people how to lose or maintain weight without understanding the human body during exercise. I'm really looking forward to my upcoming semester of dietetic courses. Not only is it my last semester before I apply to the Mayo Clinic for a very competitive internship, but these courses will really further my knowledge in the area of nutrition. I didn't decide to go back to school in order to just get the "RD" behind my name. There is so much out there in the world of nutrition that I want to learn and I want to have as much education and experience as I can in the realm of nutrition. I have also learned why so many nutrition gurus don't have RD credentials. It is a lot of work and a lot of time. I feel qualified to give nutrition information, as it relates to exercise, due to my master degree in exercise physiology. However, because no two athletes are alike, I want to be able to provide clinical nutrition and help people combat diseases, get off prescription meds and work closer to populations who suffer from diabetes, high cholesterol, hypothyroidism, breast cancer and many other life debilitating conditions. I don't believe there is an excuse why people can't exercise and eat healthy. I believe there is a balanced approach to healthy eating and I am so fortunante that I am able to learn so much about nutrition from research, science and professional dietitians. I'm not learning my information from the internet, from magazine articles or from non-qualified people trying to make some money from their nutrition book, fad diet or infomercial. As I get even closer to reaching my goal of receiving my RD credentials, I feel very fortunante that I've been able to help so many people reach their goals for weight loss and/or improvements in performance. Most of all, I practice what I preach and I thank everyone for reading my blog and appreciating my love for a healthy and balanced lifestyle and I hope I inspire others to be as healthy as possible. Presenting a poster at the ISSN new orleans conference. Here's the study which I was involved in, if you are interested in brushing up with your research..
"Effects of 28 days of beta-alanine and creatine monohydrate supplementation on aerobic power, ventilatory and lactate thresholds, and time to exhaustion." 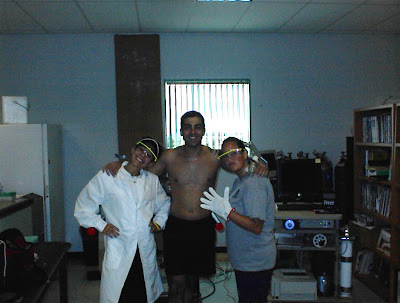 Goofing around in the exercise physiology lab..don't tell! I became very good at lactate testing on the treadmill!